The idea of improving teaching and administrative aspects of higher education is not new. Complaints by business people about college graduates in the early 1900s resulted in a study commissioned by The Carnegie Foundation for the Advancement of Teaching and a report titled “Academic and Industrial Efficiency” (1910). You can read the entire report here. The complaints by business leaders then broadly parallel complaints by business leaders today (see my earlier posts here, here, and here). Namely, that college graduates lack the skills and capabilities necessary to function effectively in industry. Among the recommended improvements were a division of labor whereby faculty would focus on teaching and research, while administrative duties would fall to others. The rationale for doing this, and for making other improvements, has been lost over time. The author of the report, Morris Llewellyn Cooke, had a good heart and his improvement suggestions were reasonable. But then, as now, faculty mistakenly see teaching as far removed from other types of work and not subject to “industrial” improvement routines. Because of that attitude, what we see happening today, 100 years later, is the deconstruction of customized teaching, whereby individuals were taught mostly in small batches and advised one-on-one, into its component parts. In other words, elements of teaching that were once closely aligned with Lean thinking (small class sizes, one-by-one academic advising) are slowly being replaced by larger class sizes (e.g. online courses, MOOCs, etc.) and less personalized attention. Many times, in various contexts, I have witnessed top managers deconstruct well-designed Lean and Lean-like processes that enhanced personal relationships in favor of poorly designed batch-and-queue processes that depersonalize relationships in an effort to lower unit costs – though they inadvertently increase total costs, which, of course, results in cuts to teachers and teaching support. The increased use of adjuncts and hiring of full-time faculty focused solely on teaching (at lower wages, of course) decouples the other main activity, research, from teaching. Research, it appears, will eventually become the exclusive domain of faculty in research universities. Faculty hired solely to teach will have no requirement to provide service to the university or service to one’s profession. Top-down leadership disables the former, while the latter will occur only if one personally motivated to do so. Reduction in faculty’s job requirements justifies the lower pay. It is clear that generations of educators and education policy makers have done a poor job of educating the public on how teaching has evolved (what little there has been); the value of research to individuals, society, and the environment; the interplay between teaching and research; the value of personalized attention in educational and administrative processes; and so on. Yet, the many chronic mistakes that teachers make and the perpetual inability of administrators to lead efforts to improve the quality of teaching undercut both the message and the value proposition for students and payers. As a result, we face a future in which higher education becomes a two-tier system: low-cost, low-touch online education for the masses, and high-cost, high-touch education for the well-to-do. This is a long-cycle phenomena during which most administrators and educators will follow the herd, while some others will recognize mistakes as they happen, make adjustments, and then make concerted efforts to inform the public that their educational offerings are better than others. 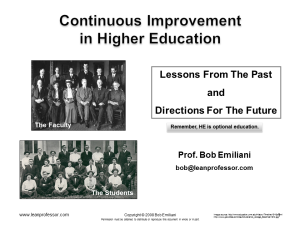 There are faculty who advocate for the faculty-administrator of yesteryear* to reduce administrative bloat, improve the functions of the university, improve educational rigor and student learning outcomes, and reduce costs. Reassigned time, faculty hiring, and the application of Lean principles and practices to academic and administrative process would be welcome improvements. * The author, Michael Cripps, mischaracterized Fredrick Winslow Taylor’s promise. Taylor’s work (1911) is precisely aligned with “The Scholarship of Administration” (2009) by Alexandra Logue. In short, both advocate the application of the Scientific Method to one’s own managerial work. Sadly, doing so is rare, resulting in poor leadership and management capabilities by both full-time administrators and faculty-administrators throughout higher education.